The oxygen content of the entire world ocean is falling. To investigate the consequences of this large-scale change, MBARI scientists are exploring a characteristic attribute of the oceanic water column in Monterey Bay called the oxygen minimum zone (OMZ). In the upper layer of the ocean, oxygen is absorbed to near equilibrium with oxygen in the atmosphere. Oxygen is also produced by photosynthesis in the sunlit surface layer. As the organic matter produced by the phytoplankton in surface waters sinks to intermediate depths of 200 to 1,000 meters, it is decomposed by microbes. That decomposition process consumes oxygen, resulting in the OMZ. Below the OMZ there is less organic matter descending and microbial decomposition is reduced. The depths are influenced by cold, dense, oxygen-rich waters that originate in polar regions. The overall result is a layer with significantly less dissolved oxygen than the waters above or below. When the surface of the ocean warms, the warmer water above does not mix readily with cooler water below, resulting in stratification of the upper layers and less mixing of oxygen-rich surface waters into deeper layers. And as the intermediate depths warm, oxygen levels decrease further because warm water holds less dissolved oxygen than cold water. Global warming is therefore expected to have profound impact on the ocean’s oxygen concentration, resulting in a significant expansion of the OMZs. Measuring these changes and predicting the ecological consequences of the expanding OMZ have been long-term objectives of MBARI’s Midwater Ecology Group, led by Bruce Robison. 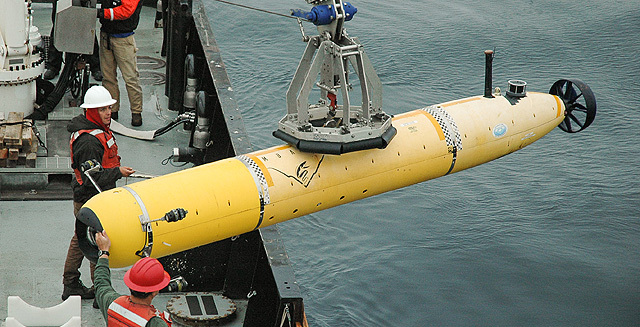 Beginning in 1996, the team has used remotely operated vehicles (ROVs) to make quantitative measurements of the abundance and vertical distribution patterns of the animals that occupy the upper kilometer of the water column over Monterey Canyon. Simultaneous measurements of environmental parameters, including oxygen, are an integral part of these ecological surveys. A significant result of these studies has been the documentation of a 60-to-80-meter vertical expansion of the OMZ and a fragmentation of the resident midwater community as each species responds in its own way to the reduction of oxygen at their preferred depths. Historically most researchers have measured the OMZ as a two-dimensional profile of oxygen concentration as a function of depth, because the traditional means to measure oxygen is to lower sensors and samplers from the surface, thus sketching a simple, vertical profile. At MBARI the approach is very different because the institute’s ROVs can fly into the OMZ to explore it from within. The ROVs have provided a transformative means to observe and sample the animals in and around the OMZ. They enable a truly three dimensional understanding of OMZ ecology and physiology; and they make it possible to conduct experimental research in situ. In addition to charting OMZ expansion, Robison’s team has discovered that in concert with an upward shift in the top of the OMZ, several key midwater species have also shifted upward in the water column. Among these is the shrimp Eusergestes similis, an agile, fast-swimming species that preys on krill and copepods. Eusergestes is an important food source for salmon, tuna, squid, and many other commercially valuable species. Is Eusergestes being pushed closer to the surface by the enlargement of the OMZ? If so, what are the likely consequences of a continuing decline of dissolved oxygen in the midwater? MBARI’s Midwater Respirometry System (which is about 1.5 meters long) is attached to an anchored line so that it can remain suspended in the midwater. The upward movement of the Eusergestes population parallels the rise of the top of the OMZ over the last 18 years. While these observations are compelling, at this stage they only represent a correlation and not a demonstration of cause and effect. To carry the investigation further, the midwater team uses an instrument developed at MBARI that measures the oxygen consumption characteristics of a species in its natural habitat. This Midwater Respirometry System (MRS) allows scientists to measure oxygen consumption without subjecting the animal to the physiological trauma of decompression caused by hauling it to the surface for laboratory measurements—the technique used by virtually all other scientists. MBARI’s MRS is the only instrument of its kind in the world and it gives the midwater team a uniquely valuable insight into the physiology of midwater species like Eusergestes. Any species that consumes oxygen has its own characteristic pattern of oxygen uptake. A mountain climber’s body adjusts to the decrease in oxygen that goes with increasing altitude by regulating its oxygen consumption. A climber may breathe deeper and faster, and may slow down the climbing effort. Ultimately, however, the climber’s body reaches a point where it can no longer regulate its oxygen consumption and the climber must compensate, either by breathing oxygen from a tank or by moving back down the mountain. The oxygen concentration below which a species can no longer regulate its oxygen consumption is called its “compensation point”. The compensation point for Eusergestes has been identified using the MRS. As the OMZ has expanded, the change in depth of Eusergestes almost exactly matches the change in the depth where the oxygen concentration equals this species’ compensation point. This is strong evidence confirming that decreasing oxygen in the water column is driving a deep-sea species closer to the surface. Like a great many other midwater species, Eusergestes is a vertical migrator. It spends the dark, nighttime hours feeding near the surface where its krill and copepod prey concentrate to feed on phytoplankton. With the rising of the sun most midwater species swim down to spend the day in deep, dark waters where they are protected from visually cued predators. Being forced out of its preferred daytime depth range and up into more brightly illuminated levels, Eusergestes becomes much more vulnerable to predators. Many other midwater species are showing similar changes in their distributions, but not all. The MRS is being used to investigate these other species as well. At the community level, one consequence of OMZ expansion is a phenomenon referred to as ecological fragmentation. Species that formerly co-existed within the same depth range are now being separated because of differing tolerances for diminished oxygen. At the same time, new ecological combinations are being created as upward shifting species are pushed into the depth ranges occupied by species from which they were previously separated. On the other hand, species, like the vampire squid Vampyroteuthis infernalis and many gelatinous animals, that adapted long ago to conditions in the OMZ will find that their preferred habitat has grown larger. Additional ongoing research on the OMZ includes behavioral studies of several species to determine activity levels and energy utilization relative to changing the oxygen concentration. The new version of the MRS allows researchers to change the pH levels in its respiration chambers during an experiment. This makes it possible to investigate how oxygen consumption rates are affected by the ocean’s increasing acidity. Comparative studies of the OMZs in the Gulf of California and off the coast of Oregon, each with different oxygen profiles, are also providing insight into the effects of an expanding OMZ and into the ocean of the future.